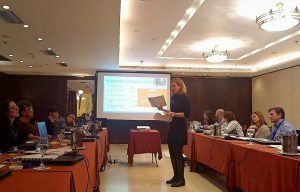 Future Balloons was present at the third meeting of the ENhANCE project, which was held in Athens on 14th and 15th January 2019, organized by TEI-THE (The University of Applied Sciences of Thessaly) of Greece. The event was attended by the 25 representatives of the partner institutions, with the presence of the special guests, Stamatis Vardaros (Deputy General Secretary of the Greek Ministry of Health), Aris Daglas (General Secretary of the Hellenic Regulatory Body of Nurses) and Athena Kalokairinou (Professor of Community Nursing). It is also worth mentioning the presence of a WHO representative (World Health Organization). The ENhANCE project aims at creating and develop a professional European curriculum common to all family and community nurses. In this sense, the preparation of the different phases of curriculum piloting in the partner universities was under discussion, as well as the development of strategies for dissemination and sustainability of the project.